Joking aside, no matter how much careful thought and planning goes into a wedding, something can and often does go wrong. We have seen many couples who face challenges such as missing decor, cakes that didn’t show up and even photographers who lose memory cards. All of these things add to the stress of tying the knot and if not dealt with properly, these things can really tarnish what should otherwise be a great day. Here are the three things that we’ve found can help you deal with wedding day stress and helpp you focus on enjoying the day no matter what goes right or wrong. 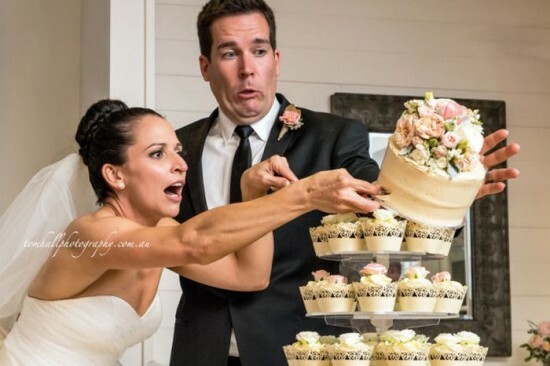 Your custom cake topper didn’t arrive on time? That’s a perfect excuse to buy another cake a week later and eat it by romantic candle light with your sweetie! The decor company forgot your table runners? Good! You’re saving the planet by using less electricity and detergent to wash extra linens. Although we always hope that a wedding goes smoothly, there's still a chance that a hickup might happen. Accepting that possibility ahead of time, and focusing on the half-full part of the glass can do a great deal for reducing your stress levels on the day. From our learning, the best thing a couple can do is hand off all responsibility on the day to a wedding planner, a good friend or a family member, let their hair down and just ride the wave. This way, if something does go wrong, you’re not burdened with the stress of having to deal with it between taking photos and saying hello to your friends and family. We always get to catch up with our couples post wedding when we hand over a painting and we hear them reminisce on the day. Even though they know that the flowers may have been the wrong colour or the band played the wrong song during the father-daughter dance, it's not obvious to the guests. How would they know if the flowers are wrong if they don't know what they're supposed to look like in the first place? This attitude can help releive some of the "what will everyone think?" worries on the day. We hope this helps put your mind at ease. After all, as long as both the bride and groom show up and say yes, you've got a wedding, and the rest doesn't matter!